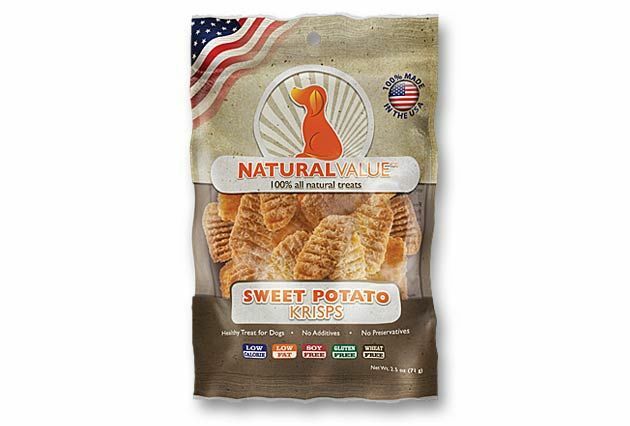 Natural Value® Sweet Potato Krisps are 100% made in the U.S.A. – proof that healthy, safe U.S.A. made dog treats can be affordable. They contain only TWO SIMPLE INGREDIENTS - Sweet Potato and Rice Flour. These delicious, crunchy, 100% all natural treats are LOW FAT and LOW CALORIE making them a great, guilt-free reward for your pet. They're packaged in small bags as part of our "Dollar Program".